It's my least favorite... no, second to least favorite... no, third to least favorite thing to do. It comes after weaving in ends and large bind offs. I swear I've watched hours of Full Metal-Brotherhood for two nights, trying to get through this little stretch of hem and every time I count my rows, I'm still a few short. But, I'm at that 23rd row and then I can move on to the lace pattern that all of the crafting world is in love with- Pomme de Pin. 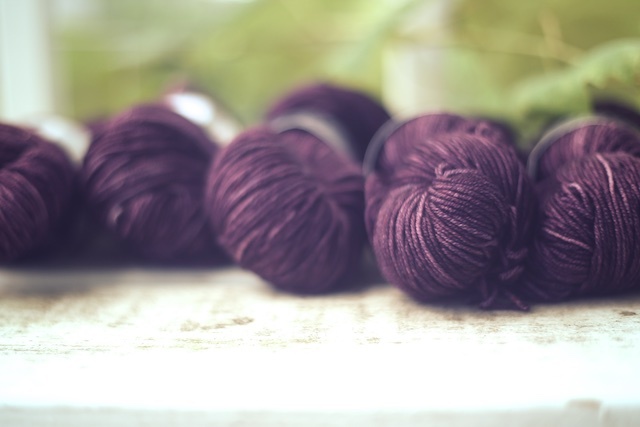 I love this purple colorway from Gynx Yarns, but I'm not quite sure how it will look in the lace pattern. I know lace can look great in darker colors, but I find that I can see the stitches better in a lighter shade. So, only getting well past this ribbing will let me see the results. 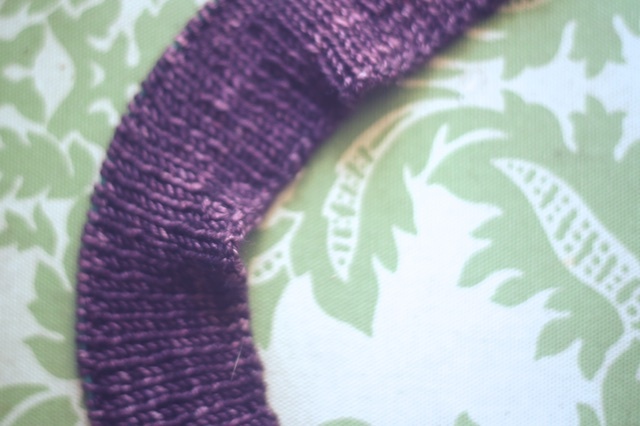 I find 1x1 ribbing is extra tricky when in a dark color, knit in a darkish room, with small needles. This is kind of a "big deal knit" to me, so I don't want to have to get several inches in and realize it's too big, like so many times before. 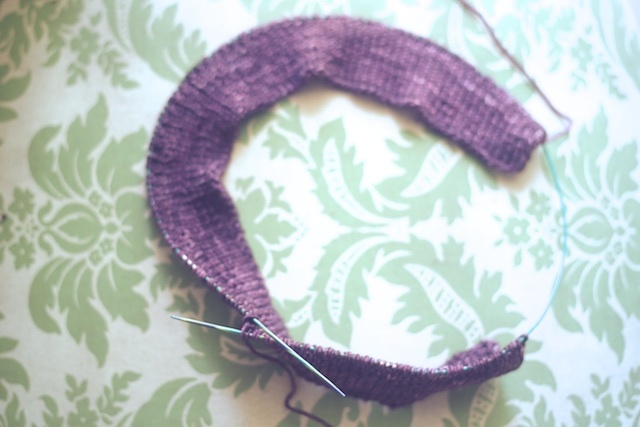 I want to get this ribbing right from the start. I have discovered that Karbonz needles do, indeed, help loose knitters keep a grip on the yarn. But mine haven't arrived yet, so I decided to just use a size 0 on the ribbing and I can move up to a 2 or 3 for the body. I could knit continental and use a larger needle, but I can't bear to knit 1x1 ribbing that way. So, pointy size 0s it is, but just for an inch and a half, right? This is Laura's Goth Girl shade in Smooth Sport. It is my first time to buy a sweater's worth of yarn from an Indie Dyer. At least, it's the first time I did it on purpose. That's why I'm knitting it for Little Bobbins Knits' Purposeful Stash-along. It's not old stash, but it is a pattern I've wanted to knit for a while and the desire to knit it in this yarn is an old one. So the whole thing has been very purposeful. Hopefully that counts for the KAL. It's kind of exciting to knit a whole sweater out of hand dyed yarn. I did eek a cropped sweater out of some Gynx Yarn for my Hetty, but that was a happy accident that required a lot of weird splicing to work out. 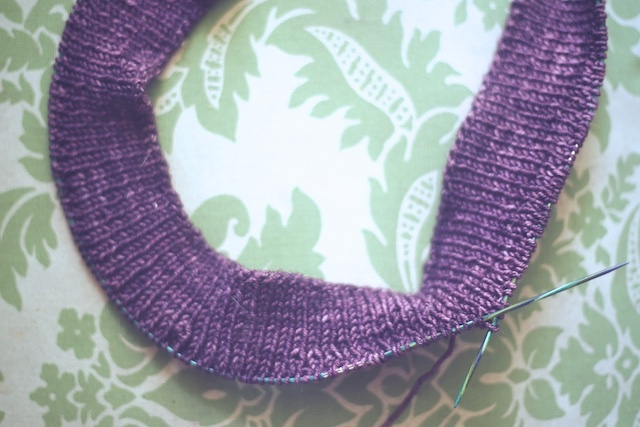 So, there's no end to the inspiring photos of finished Pomme de Pin Cardigans to motivate me. I just need to finish those last few rows of ribbing. Ugh. At least I've had time to focus on it. There really wasn't anything else to do. The funeral was a few days ago and I've spent time sleeping late, reading, and knitting in my pajamas through the mornings. I also made a few impulse yarn purchases. My grandmother has had plenty of visitors, so it seemed the thing to do. I was kind of emotionally and physically spent, anyway. But yesterday I was back to doing normal things again.